In 1946, Leo Ferris, a New York realtor who would later be known primarily as the man who invented the shot clock, and a business partner named Ben Kerner who worked in sports advertising, were given the rights to an expansion team in the National Basketball League, which they based in the city they both worked in at the time, Buffalo, New York. They named the new franchise the Bisons, because the city of Buffalo was named after the animal, and also because they were terrible at coming up with names and decided to just copy the local baseball, football, and hockey teams, all also named the Bison. Maybe they thought adding the ‘S’ would make us think it was different. It wasn’t. In the preseason of 1946-47 Ferris set up preseason games to be played in his hometown of Elmira in hopes of encouraging an affiliate team to be set up there, a very similar idea to the G-League that’s being used as a farm club league for NBA teams right now. For the regular season they rented out the Buffalo Memorial Auditorium owned by the… Buffalo Bison. The hockey team. Their first game had over 4,000 fans show up in a 50-39 win over the Syracuse Nationals but that excitement quickly died down and on average they only filled a quarter of the stadium. In fact, they were losing money so rapidly they were on track to go bankrupt by the end of the season. So only 13 games into the season with a 5-8 record and an average attendance barely scraping 1,000, Ferris and Kerner packed up the team and moved them west to Moline, IL, where the team was rebranded the Tri-Cities Blackhawks. They had a tough road schedule as they were still in the Eastern Conference despite now being one of the more westernmost teams, and because of that their play on the court never improved throughout the season and they missed the playoffs. They were far from anything special, not posting a winning record at a single point throughout the season and without any players averaging over 12 points per game. But that season they did have a social breakthrough in signing William Gates, the first ever black player to start for a team in a professional league. Unfortunately he predictably dealt with a lot of racism throughout the season from fans and opposing players, and late in the season he snapped at one opposing player’s taunting and started a brawl, which got him banned from the league for a year. With Gates gone the next year, they brought in Whitey Von Nieda as his replacement. No that’s not a joke, they literally replaced their only black guy with someone named Whitey. 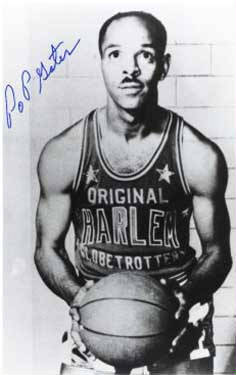 Von Nieda was a highly coveted rookie who’d averaged 24 points per game in the military league while fighting in WWII. Despite his addition to the team though they started the season off slowly and after 20 games their first ever head coach, Nat Hickey, was fired and replaced by Bobby McDermott, who was known as the first great long range shooter in basketball. McDermott played for the team as well as coaching, and his shooting allowed for spacing that was rarely seen in basketball at that time and kickstarted a turnaround in the team under his reign. 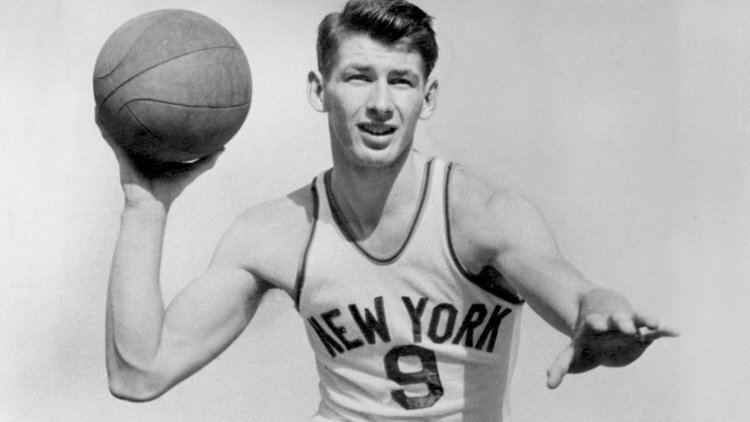 He was named to the All-NBL Second Team and Whitey was named to the All-Rookie team, as they battled their way to a .500 record and the Western Conference Finals before being swept by George Mikan’s Lakers, who would easily go on to win the title. Toward the end of the 1947-48 season the NBL and BAA began negotiations on the merger that would form the NBA, and, as the season ended, six teams, including both teams that had played in that season’s NBL Finals, left the league. One of those teams that had left for the BAA was the Fort Wayne Pistons. In the fifth round of the BAA draft they drafted a Consensus All-American named Murray Wier, but he signed with the Blackhawks instead. The BAA threatened to sue for his rights, but the Hawks countered that the departure of six teams meant the leagues were no longer equal competitors working together to make professional basketball the best that it could be, and that the NBL deserved reparations or else there would be a player war between the two leagues. This was such a big deal it almost stopped the merger of the leagues, but they did eventually strike a deal that punished the team but did allow for Wier to play for the Blackhawks instead of the Pistons. He wasn’t any good though and averaged only 4 points per game through the year. That didn’t matter though, because they kept the same core they had the previous year, and despite McDermott having a bit less of a role as a player the team’s offense improved again. Center Don Otten came out of nowhere to win League MVP without a dominant force like Mikan to scoop it up automatically, and the team finished 2nd in the West. They missed out on the finals again though as they couldn’t overcome the Oshkosh All-Stars, who were easily the best defense in the league. Against Oshkosh they may not have won the battle, but they most certainly won the war. On August 3, 1949, the NBL and BAA merged, and six of the NBL teams met the qualifications to play in the new NBA. Oshkosh did not meet those qualifications. Being in the NBA did have a drawback for the team though. McDermott was against the merger and decided to leave the team and play for the Wilkes-Barre Barons of the ABL rather than keep playing for Tri-Cities in the NBA. So the team had to find a new coach with days until the start of their first season in the league and they also had to replace him as a player. And of course, at that same time, Leo Ferris left the team and sold his shares to Kerner when he was offered the GM job for the Syracuse Nats. Although they won the first ever NBA game, played against the Denver Nuggets, the team lost the next six to begin the season 1-6 under an interim coach before they finally found the man for the job. Red Auerbach. The Red Auerbach. Auerbach changed things early on as he quickly grew to dislike Von Nieda and benched him after just a couple games before eventually selling him on for nothing; literally just cap space. He also quickly found a third focal point to replace McDermott in picking up power forward Mike Todorovich for peanuts from the soon-to-be-bankrupt St Louis Bombers, meaning that they now had a formidable frontcourt trio of Otten,Todorovich, and breakout rookie Dike Eddleman. But that trio didn’t last long, as Otten began to lose quickness as he aged and got into foul trouble a lot during this season. In fact, early in the season he managed to get EIGHT fouls in a game, a record that still stands to this day. That’s a record that he set a month into the league’s existence, that hasn’t been equaled in the 68 years since, and realistically may actually never be broken. These foul troubles though got him in trouble with Auerbach, and in February he was traded for a younger replacement, a double-double machine named Jack Nichols. The team improved with Nichols in the lineup and snuck into the playoffs despite a losing record. In the playoffs Nichols played some of the best basketball of his career, but it didn’t matter, as the team couldn’t keep up with the Anderson Packers and lost in the first round. In the offseason, six teams folded, and the Blackhawks got Frankie Brian, the star player of the Anderson Packers team that had knocked them out of the playoffs, in the dispersal draft. 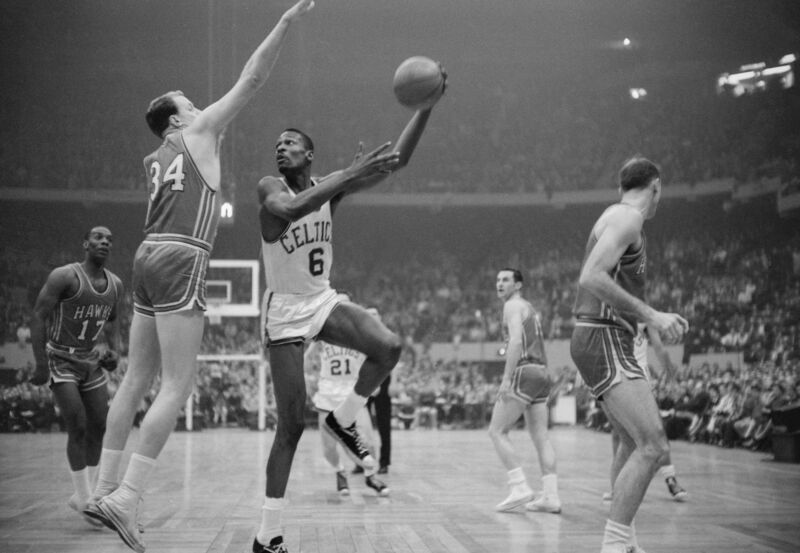 Despite having a star point guard now in Brian, the management selected a pure passer with the 4th pick in the draft in future Hall of Famer Bob Cousy. Auerbach thought that was a terrible pick though as he much preferred Larry Foust from La Salle and believed they didn’t need another point guard. This was the second move in the last few months that the execs ignored his opinion on, and he quit two days after the draft out of anger at that. The problem was, it wasn’t even worth drafting Cousy. He didn’t want to move away from the Boston area where he went to college because he loved his second job owning a driving school, so he demanded a $10,000 per year contract, almost twice what they could afford to offer. So they ended up sending him to Chicago for cash, and they’d lost the best coach of the era for what ended up being absolutely nothing. 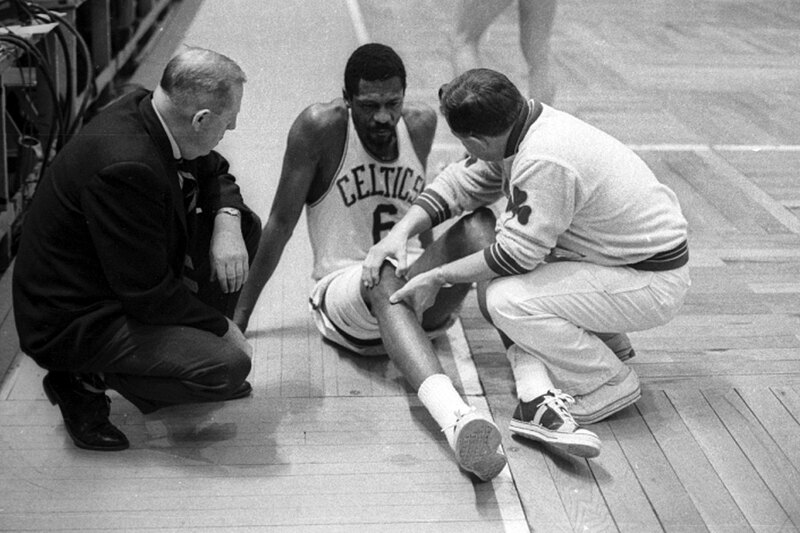 Despite these problems, the team started 3-0, including a win over Auerbach’s new team, the Celtics, to kick off the year. Three games later though, Jack Nichols left the team to enlist in the Marines, and that’s when things really started to go downhill. The team went through two coaches within the first 26 games of the season, and started having financial troubles at the same time. Unable to afford to hire a new coach for the rest of the year, Todorovich volunteered to be a player-coach for the rest of the year. The team really struggled on the court as well as off it, and though there was the positive of having two players in the first ever All-Star Game in Brian and Eddleman, they finished bottom of the West. Brian wanted out by the end of the season, so they traded him to Fort Wayne for a couple role players (one of whom refused to ever play for the team), and Todorovich left the team as well to become an insurance broker, because at this point players would literally rather stop playing basketball than playing for the Blackhawks. Since they’d finished with such a bad record, were losing money, and nobody wanted to stay on the team, it was expected that they’d have to fold by the end of the next season and in a last ditch attempt to save the team, Ben Kerner moved the team to a big market in Milwaukee and they became the Hawks. Although the move to Milwaukee brought some stability to the team, they still couldn’t field a competitive team coming into the season, with two of their key players from an already struggling team having left. To try to help stabilize the often-changing roster along with the finances, they made the decision to bring back Don Otten to the team to form a partnership in the post with the number 2 pick Mel Hutchins. Hutchins quickly made his mark as one of the best defensive big men in the league, and he also led the league in rebounds as a rookie, with 13.3 per game. Despite Hutchins’ efforts, the team was completely awful. Dike Eddleman was traded from the team while he was playing in the all-star game, a past-his-prime Otten led the team in scoring despite only scoring 13 points per game, and they finished with a dismal 17-49 record, easily worst in the league. Now you’d think that getting the top pick in the draft would help kickstart some sort of turnaround. After all, teams these days tank specifically for that reason. Well, the Hawks just happened to get the first pick in what must have literally been the worst draft ever. With the first pick they selected Mark Workman. Mark Workman played a grand total of 29 minutes for the Hawks. The team did improve though, as Jack Nichols came back from serving in Korea after two years and returned to lead the team, and fit in very well alongside Hutchins, who improved his game from the previous year and was named a starter in the all-star game. They, as expected, didn’t have a great start, but they brought in solid role players throughout the season. They missed out on the playoffs again, but only by one game, and they looked like they were just short one or two pieces. For the first time in their NBA history, they actually retained a coach through the offseason, and things were looking like they could actually be on the upswing for the first time in a while. Boy were they wrong. Before the season even began, Hutchins was sold to Fort Wayne, dooming the season before a single game was played. On top of that, Nichols had a historically awful start to the season, shooting 21% for 15 games before being traded to Boston for five guys who would never play a game in the NBA. Kerner didn’t want his team to give up on the season that early on, with the Hawks having not had a truly successful season since the merger, so he put together a trade to bring in Max Zaslofsky, one of the biggest stars from the late 40s. He quickly realized he didn’t have enough money to pay Zaslofsky, so he got traded just 9 games later. They predictably fell back down to bottom of the west, fired their coach, and ended up with the second draft pick. At this point Kerner was very tired of all of the losing, and thought it would be helpful to have someone employed to specifically take care of player management for the team, in addition to the coach, so he brought in Marty Blake as the first true NBA GM to take control of personnel decisions. Blake’s first couple moves proved to be very smart ones, as he brought in future Hall of Famer Red Holzman, who spent the year before as the team’s backup PG, as coach, and then drafted Bob Pettit with the second pick. 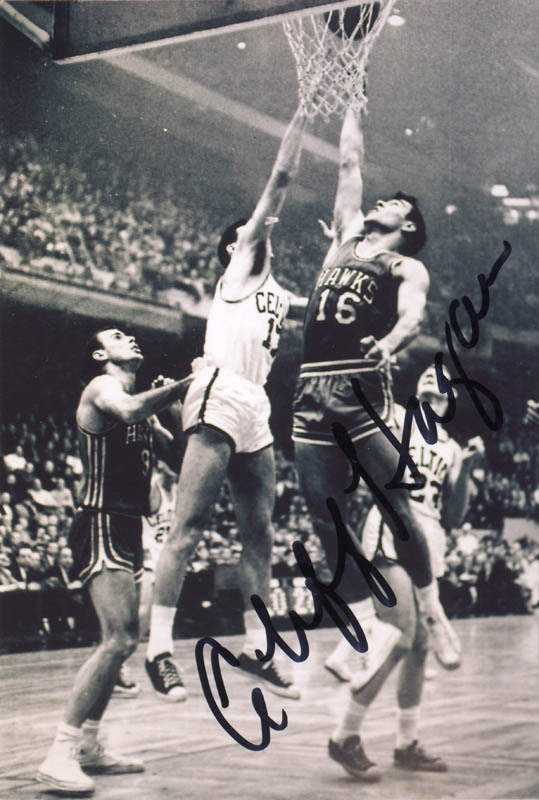 Pettit quickly became the face of the franchise, and went on to win Rookie of the Year and make both the All-Star Game and All-NBA First Team with crazy stats of 20 points and 14 rebounds per game as a rookie. More good news came their way though, along with bad news for the league itself, as the Baltimore Bullets folded, bringing the league down to eight teams. 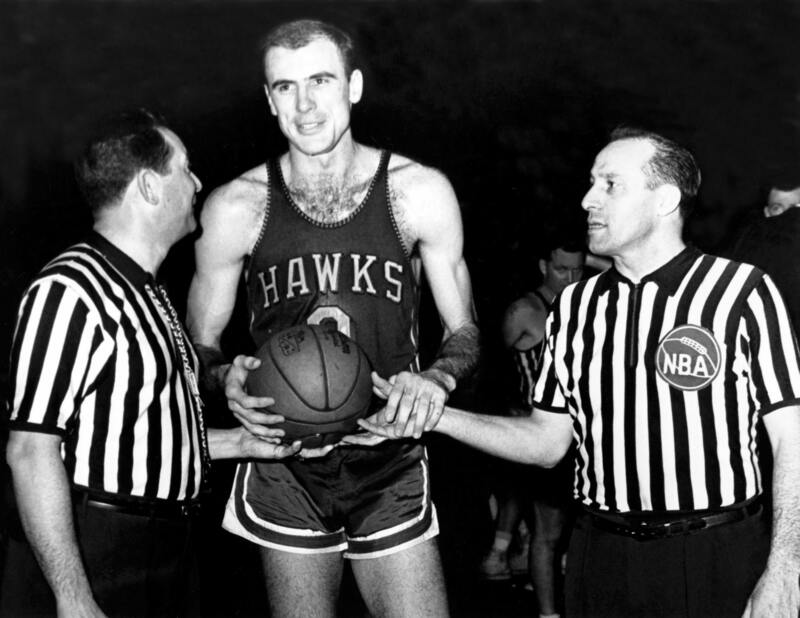 The Hawks got the top pick in the dispersal draft, and selected the one guy selected over Pettit, Frank Selvy, who’d become a sensation in the basketball world in college after scoring 100 points, including a buzzer beating half-court shot to end the game, in his school’s first ever televised game. Selvy went on to have a very solid, if perhaps slightly underwhelming, rookie year, which he scored 19 points per game but wasn’t too effective in ways other than at scoring. That ineffectiveness on defense and ball movement shouldn’t have mattered though alongside a star as good as Pettit, but unfortunately it did as they had absolutely no support in the team. Every role player from the previous couple years had taken a step back, and the acquisition of Chuck Cooper in the offseason hadn’t panned out as they were expecting either and he basically was just a defensive ace without much of a contribution outside of steals. Without the Bullets around to be worse than them anymore, they finished bottom of the league despite improving their win-loss record, and would get the top pick again.